An Interview with Author M.Y. Zeman! Today, I'll be interviewing paranormal YA author M.Y. Zeman! 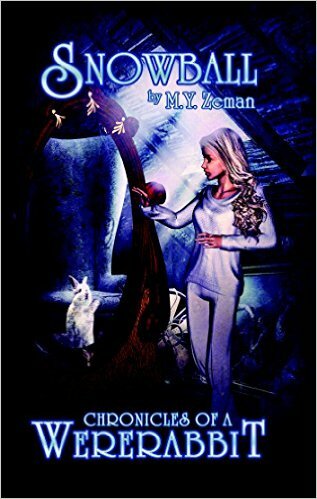 Zeman lives in New York, and her three pet bunnies were the inspiration for her Chronicles of a Wererabbit series. I'm actually reading her first Wererabbit book, Snowball, right now! You can connect with M.Y. Zeman on Twitter. Over to you, Ms Zeman! I followed in my mother's footsteps and became a computer and math teacher. I have also been a professional web and graphic designer. But my first love is writing. I have been writing since I first learned to read. My first book, Running Into the Black, is a courtroom drama aimed at adults. Currently, I am writing a young adult /fantasy series, Chronicles of a Wererabbit. Science fiction and fantasy has always been my favorite genre. I have just completed the second book in what will be a 7 book series entitled Chronicles of a Wererabbit. It is the coming-of-age story of a young girl who was born a rabbit and believed her destiny was to die in a laboratory. One night a vampire saves her and becomes her father. It is her journey of becoming a hero. For this series, my three dwarf rabbits were the original inspiration. I was writing a book that focused on Rosa and Rorin, the two vampires who were raised by werewolves. I needed a secondary character and I wanted to create something that I hadn't seen before. I glanced over at my bunnies and scribbled down on a piece of paper "Girl/rabbit". Every time I mentioned her to my Mom and cousin they would say that she was their favorite character. My cousin suggested making her the center of the story. 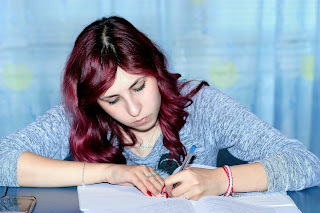 At first I was hesitant, because it would mean throwing out weeks of work, but once I began writing I fell in love with her character and realized her story was the one I should have been telling all along. Now Rosa and Rorin are secondary characters in Snow's world. When I was a child I began telling stories about my stuffed animals to my Mom. She wrote them in little books and I drew the pictures. I wrote my first "novel" when I was eight. It was a 35-page handwritten story called "Tex the Talking Parrot". Mom submitted it to a few publishers and I got my first rejection letters! I kept writing short stories, articles and poetry over the years. I published my first real novel six years ago. I began writing Chronicles of a Wererabbit right after that. The first book in the series was published last year and the second just came out. I'm working on the third. I do most of my writing in my room, but I keep a notebook with me so I can always jot down my ideas wherever I am. Often it happens in the middle of the night. I'm a big fan of Stephen King, Dean Koontz, Kurt Vonnegut and Agatha Christie. But my favorite books of all are science fiction /fantasy such as Harry Potter, The Maze Runner trilogy, Percy Jackson, Chronicles of Narnia and the Lord of the Rings. My all time favorite book is It by King. Since I published Chronicles I became friends with other authors online. Their advice and experience has been invaluable. Not only are they supportive because they have been through it before, they have given me good tips. The biggest one being the importance of creating and keeping a mailing list. It's the best way to keep a fan base and let them know when your new books come out. If you're a children's or YA author, and you would like to be interviewed for this blog, Click Here.